This is another of the Sleek eye shadow palettes. Presumably by the name of the palette this is the first one which came out. 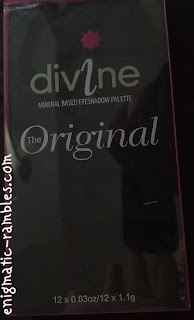 As with the other two palettes I have (Bad Girl, Storm) the black (1) is exceptionally pigmented and needs a special mention. There are 11 shimmer shadows and one matte, being the black (1). All of these are nicely pigmented and really transfer well from pan to eyelid. Of all the shades I like 3 best, its a shimmery navy. Also 5 is a unique shade which I haven't seen before, its a bluey, greeny, turquoise shade, something which reminds me of mermaids and the sea for some reason.